Are you unhappy with your smile? Maybe your teeth are stained, chipped or not aligned correctly? Perhaps you would simply like a brand new smile to make you look and feel better? 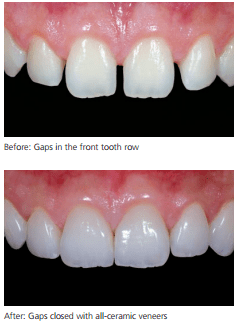 Veneers could provide you with the solution that you have been looking for. A veneer is a wafer-thin, custom-made piece of material that is designed to cover the surface of your teeth to improve their appearance. Generally, veneers are made from porcelain and can be Porcelain as a material is more resistant to stains and has light-reflecting properties similar to natural teeth. Veneers can be the perfect way to provide you with a new and improved smile. If you are considering veneers and would like to discuss the treatment with Amit in more detail then please book a complimentary consultation by dialling 0121 455 9233.